We’re pleased to provide used highway guardrail, 13 1/2 foot and 26 foot W-Beam Panel, 20 inch wide ‘Thrie-Beam’ Panel and 13 1/2 foot long, used I-Beam Posts, highway safety barrier packages and other used guardrail products. Thrie-beam Guardrail is available in “A” Grade quality and Is used in many applications. Thrie beam is most commonly used in the follow applications: Agricultural Fencing, Industrial Safety, Livestock Fencing, Feed Bunks, Bridge terminals, Erosion Control, Traffic Flow-Pattern Barrier and Fencing for protection of private property. Thrie-beam is typically a less expensive material to use when coverage of square footage is the goal of the given project. 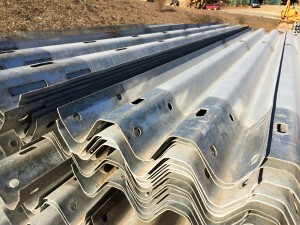 “Tri-Beam” or “Twenty Inch Panel” or “20 inch wide” panel, as it is often called, is exceptionally durable due to the increased corrugation used to construct the panel. Tri-beam has been a proven member of the guardrail road safety workhorse family for decades. It is strong, safe, durable, effective and exceptionally long-lasting. We expect to provide you with the absolute best prices on quality used Thrie-beam in the nation. If you would like to discuss the vast possibilities of using Thrie-beam Panel on your project. Please give us a call.